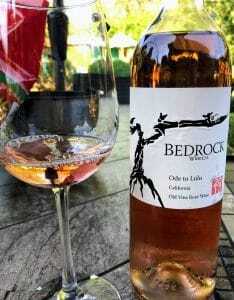 A few quick thoughts on the 2017 Bedrock Ode to Lulu Old Vine Rosé. When Morgan was five years old, he produced his first wine called Vino Bambino–a Pinot noir. Several New York restaurants including Blue Hill, Gramercy Tavern, Delmonico’s, Mesa Grill and Charlie Palmer’s Aureole featured later vintages of Vino Bambino on their list. Before starting Bedrock, Twain-Peterson worked harvest at Ravenswood, Noon Wine Cellars and Hardy’s Tintara winery in the McLaren Vale and the 5th growth Ch. Lynch-Bages in Bordeaux. In 2013 Chris Cottrell joined Bedrock. The two also team up for a sparkling wine project called Under The Wire that features such unique wines as a sparkling old vine Zinfandel and an Oakville field blend from Napa Valley made from French Colombard, Chenin blanc, Malvasia bianca, Muscadelle, Semillon and Chardonnay. In 2017, Twain-Peterson became a Master of Wine after completing a dissertation on old vine field blends. The 2017 Ode to Lulu rosé is a blend of 75% old vine Mourvedre/Mataro from Bedrock Vineyard and Pagani Ranch in the Sonoma Valley with 25% Grenache from Gibson Ranch in McDowell Valley in Mendocino County. Around 1500 cases were produced. The white pepper spice adds gorgeous complexity to this dry rosé. High-intensity nose–raspberry and strawberries with lots of white pepper spiciness. It almost smells like a Gruner Veltliner and Bandol had a baby. On the palate, those reds fruits carry through with mouthwatering medium-plus acidity. Medium-bodied weight has some phenolic texture, but that doesn’t distract from the refreshing aspect of the wine. Moderate length finish brings back the white pepper spice and adds a floral note. For $18-22, this is a fantastic and very character driven rosé. This can play a jack-of-all-trade role as a food pairing option. I can certainly see this rosé shining on the Thanksgiving table which makes me very glad I have a few more bottles. Tagged Aureole, Bandol, Bedrock, Bedrock Vineyard, Blue Hill, Ch. Lynch-Bages, Chardonnay, Charlie Palmer, Chenin blanc, Chris Cottrell, Delmonico’s, French Colombard, Gibson Ranch, Gramercy Tavern, Grenache, Grüner Veltliner, Hardy’s, Joel Peterson, Malvasia bianca, Master of Wine, McDowell Valley, Mesa Grill, Morgan Twain-Peterson, Mourvèdre, Muscadelle, Noon Wine Cellars, Oakville, old vine, Pagani Ranch, Ravenswood, Rosé Wine, Semillon, Sonoma Valley, Sparkling wine, Under The Wire, Zinfandel.